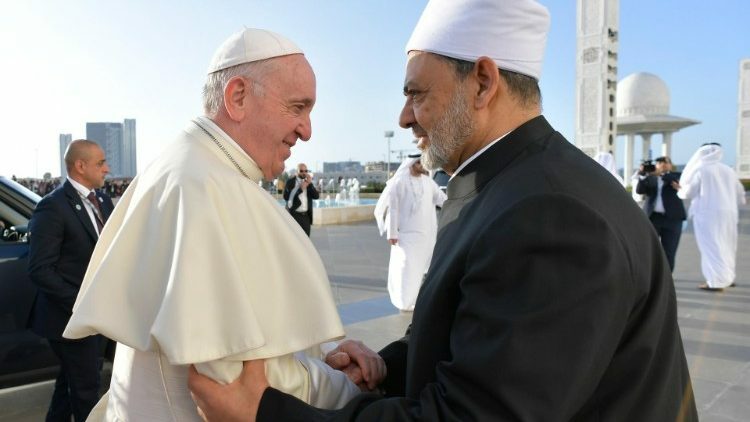 The significance of the gesture of Pope Francis and Grand Imam Ahmed el-Tayeb in the light of earlier pontificates: erroneous interpretations of religious texts and the weakening of spiritual values lead many people to extremism. Vatican News, 4 February 2019 – Eight hundred years after the encounter between St Francis and the Sultan al-Malik al-Kamil, the Pope who bears the name of the Saint of Assisi presents himself to the “Muslim brothers” as a “believer thirsting for peace”. Together with the Grand Imam of Al-Azhar, he signs a Declaration destined to mark not only the story of relations between Christianity and Islam, but also the history of the Islamic world. Pope Francis, who coined the expression “a world war fought piecemeal”, with this journey and this gesture inserts himself into the path traced out by his predecessors, and takes another step forward. At a time when the world faced the threat of nuclear war (a threat that in our day, unfortunately, once again looms over us), Saint John Paul II, beginning with the encounter at Assisi in 1986, engaged religious leaders in order to emphasise how the most diverse faiths should promote peace, coexistence, and fraternity. After 11 September 2001, when terrorist fundamentalism forcefully re-entered the international scene, the elderly Polish Pope made every possible effort to remove any religious justification for the abuse of the name of God in order to justify violence, terrorism, and the killing of men, women, and children. Benedict XVI moved along this same path throughout his pontificate. In September 2006, then-Pope Benedict said to the leaders of Islamic countries that, “faithful to the teachings of their own religious traditions, Christians and Muslims must learn to work together, as indeed they already do in many common undertakings, in order to guard against all forms of intolerance and to oppose all manifestations of violence”. Today, Pope Francis signs a document where not only is any justification of violence undertaken in the name of God forcefully rejected, but important and binding affirmations are made concerning Islam and certain interpretations of it. The words concerning respect for believers of different faiths, the condemnation of all discrimination, the need to protect all places of worship, and the right to religious liberty, as well as the recognition of the rights of women, are challenging. The emphasis on the deepest roots of nihilistic terrorism — that traces its origins to erroneous interpretations of religious texts, but also to “a moral deterioration that influences international action and a weakening of spiritual values and responsibility” — is also significant. These elements promote frustration and desperation, “leading many to fall either into a general feeling of frustration, isolation and desperation leading many to fall either into a vortex of atheistic, agnostic or religious extremism, or into blind and fanatic extremism”. The Bishop of Rome and the Grand Imam of Al-Azhar declare that, in the East and the West, believers in different religions, who look upon one another as brothers and sisters, can help each other to seek to avoid the “world war fought piecemeal” from breaking out in all its destructive power.